I always feared the most, that our castle will be under attack by some monster. From childhood, I have always looked up at the sky and wonder, if some creature is heading our way. I have never seen one, but my nanny and parents brought me up in awe of the giant, green, indestructible dragons. But my vigilance gradually slackened as I grew up, until one day, I stopped watching at all. And that was coincidentally the same day, when we really were attacked by a dragon. It arrived in armor and began to hurl fireballs around. It was a completely different dragon, than I ever imagined it to be. But that does not mean, that it would mean less threat to the village. As players, we have to train such dragons and try to teach them to inflict the greatest damage possible. 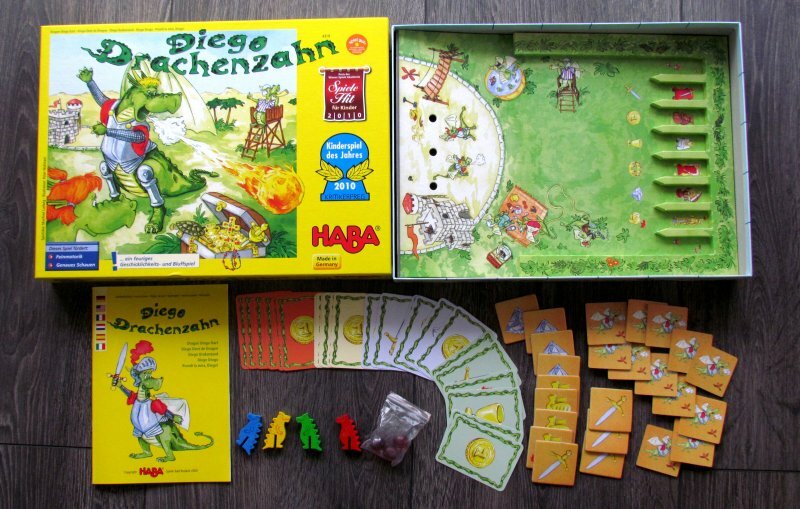 At least this is, how Manfred Ludwig pictures fun in his game Diego Drachenzahn (Dragon Diego Dart) released by HABA in 2010 with illustrations by Peter Nishitani. Elongated box is filled with dragon face, training his targeting skills on a shooting ground. There is a referee, competitor and involuntary targets in the form of small castles, that are inhabited by real folks. For the players, however, particularly contents of the box is essential. 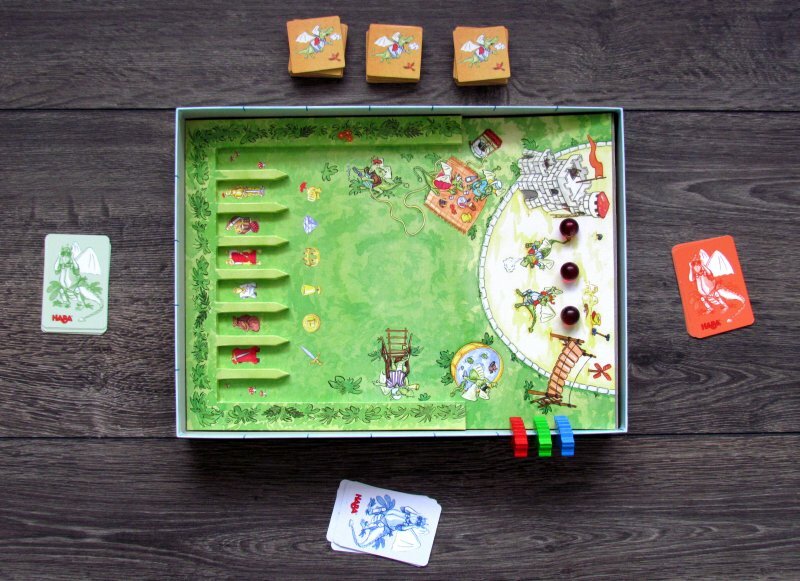 And here everything is clearly dominated by the bottom of the box itself, which also forms game board. Sloping space goes from three holes, through defined fences along the sides towards eight slots. Each corresponds to one target. But what would we do with that firing range, if there was nobody to inhabit it. Fortunately, there are four figures of dragons. But they will not get into fighting themselves, These pawns have only two legs, which easily clips them to the edge of the box, but will not hold their weight, when standing straight. One space after another, they will count points for each player. To do some shooting, you will most certainly need also some fireballs. Specifically three, that are red and glassly. All participants will receive for their training also a set of targets tiles and cards for betting. 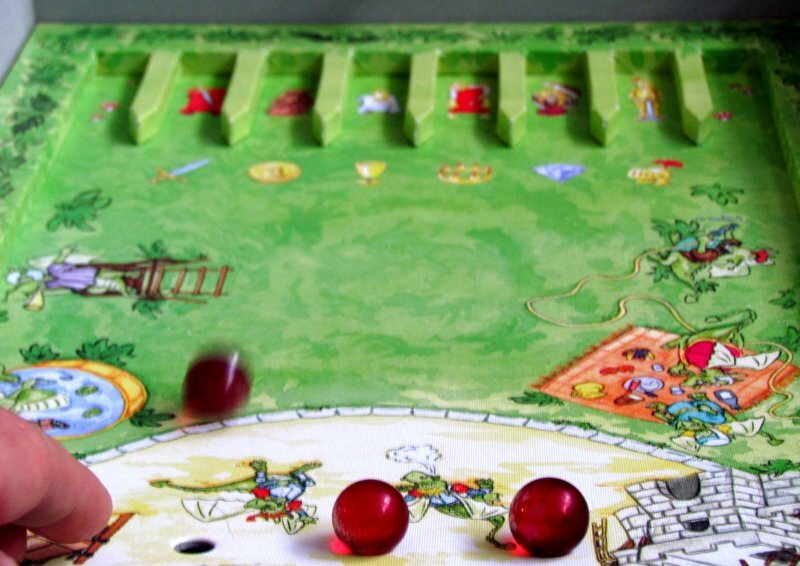 At the beginning of the game, each player chooses a colored dragon and puts him on the starting line of scoring route. It winds along the edge of the box, where figure stays still thanks to its solid wooden feet. According to the color given to each participant, they get set of six cards, that correspond to possible targets at the shooting range. All square pieces are then shuffled and spread face down beside the board. Starting player takes three fireballs into his hand. But even before the shooting starts, he first needs to know the target he should aim for. Therefore, he covertly turns one of the tiles and looks at its picture. This is a place, where his fiery breath should stop. All three balls are placed on their positions in the holes and by light flick are sent from the hill towards their goal. Players are trying to influence their motion sensitively to end, where they were told. But they should keep their joy or disappointment for themself. Before unveiling, other opponents try to guess, which target was their primary one given by the tile. 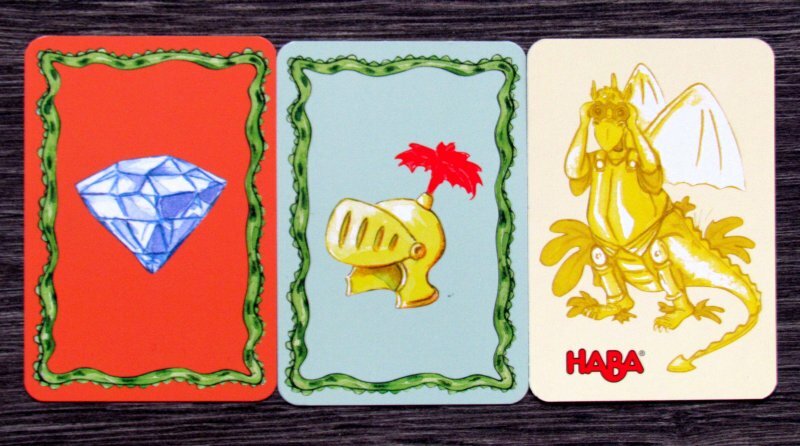 Every player therefore secretly chooses card with his guessed objective, which should be on the tile..
All reveal their choices and successful players may move forward. Those, who guessed correctly, travel one space. Shooter alone may run even more than that. For each hit in the right section, player gets one victory point and moves his dragon forward. Shooter role changes and game continues until one of the dragons makes it across the finish line. He becomes true dragon sharpshooter. Diego Drachenzahn a fiery game about dragons. Just that alone would be enough to ensure success. But thankfully, author did not see this sufficient, so in addition to a nice environment, he created also wery good game, that tests your finger dexterity and feeling. Precisely this makes it an excellent entertainment for children since five years of age and allows them to practice their fine motor skills. It all seems very simple. But the balls are restless and just a little bit stronger flick and ball rolls into a different target, than you imagined. In addition, you can not unleash your frustration until you tell the others. It trains children self-control, otherwise opponents can make a profit point very easy. For smaller children, this is a major problem, because when in possession of secrets, they are unable to keep it. And this bluffing, although its great, can be (in the lowest ages) considered to be a minor shortcoming. 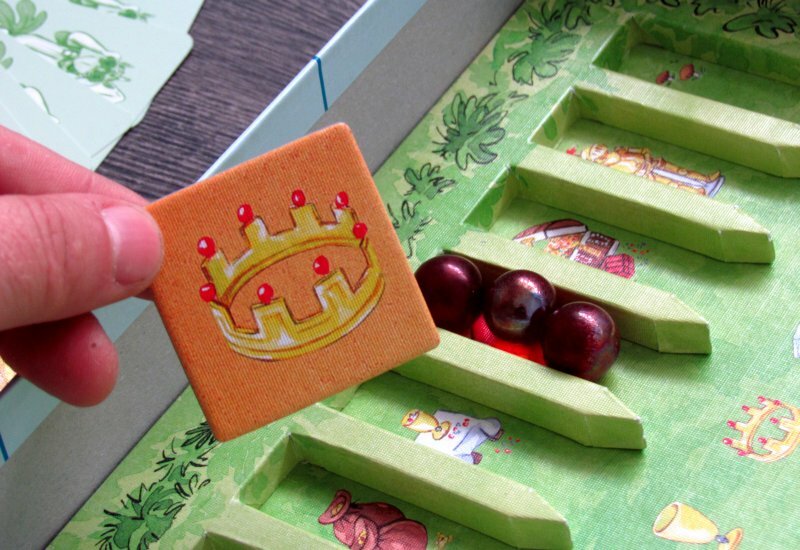 The more enriching playing is, when game meets with older children or even adults. Nobody does come close to one hundred percent success rate on shots during the game, which makes it pretty exciting. Its usually exactly the opposite. Balls are flying to all sides, whether its a little first grader, his parents, or even a grandma. And they all laugh at the game, have fun and relax. Although the game.. its pretty much about rivalry, so in some cases, there is no chance to relax. Betting a bit inhibited with only two players and game is not as fun as with multiple opponents. Effect on time is almost unnoticeable regarding the number of players, because either way, you need around those fifteen minutes of time to fire all your dragonballs. But it is not a good game for the road, because you always need a flat and stable area. Randomly determining targets for each round is important, and maintains tension in the game. Still, game is always the same, but it even so surprisingly is not becoming boring with more matches. Maybe after more time it may come to this, but if you are going to play with reason and kids will not sit around dragon box every night, you can be sure to come back to dragons each time with passion. And it can also be because of its great processing, pleasing illustrations and excellent sloping surface at the bottom of the box. Balls are not going anywhere else. Drachenzahn Diego is a nice children entertainment, which highly depends on the skill. And kids can easily defeat even adults, so circle of people interested in a rematch is significantly extended beyond the expected age limits. Diego Drachenzahn is innocent dragon, which very cleverly breaks down all borders and entertains people of all ages. Only then, each blow will bring fun to you without any doubts.